I looked up and realised that as long as this Belgian sky is blue, with jet vapour trails heading in every direction, I’ll never forget living in Istanbul. The vapour trails here take me back to the container ships, ferries, fishing boats, rowboats and every other kind of boat, jostling for space, as they criss-cross the blue of Istanbul's Bosporus. It made me think ... what I would do if today was a day back in Istanbul? I would begin at Taksim Square . I am sure. I would wander along Istiklal Caddesi, remembering to listen for the ancient trams that roll up and down the centre of that walking street. I would detour into Cicek Pasaji (the Flower Passage), a shortcut through to the Fish Bazaar, enjoying the architecture inside, smiling but leaving behind the waiters who beckon and invite me to eat. At this point, it is always too soon to stop for food. Once in the Fish Bazaar, I would turn left and head for the scarf shop, the one where I used to sit chatting with a Turkish guy, listening to his stories of how life was for him in that massive ancient post-modern city. Later I would pop back out onto Istiklal and walk on until I reached Robinson Crusoe - my beloved Istanbul bookshop. I would linger awhile ... walking out, after an hour perhaps, with just one book I couldn’t resist. Then I would pass by the Pasabahce store across the street, not wanting to carry their beautiful Turkish glassware as I wandered. At the end of Istiklal Caddesi, there is always the decision … should I follow the winding road down the hill or catch the world's oldest underground cable car at Tunel. Almost always I would opt for the walk, passing the Mevlevi Monastery where the dervishes whirl and mesmorize me whenever I watch them. And on down the hill, past the small music shops... past the blue window, and then unable to stop myself, I’d take a right turn and head for Galata Tower ... just one more time. Paying my entry fee, I would step into the lift then travel on up the stairs to the 360 degree balcony. There ...there is the best view out over this city that I came to love. This girl from small town New Zealand looking out over the ancient beautiful city ... who could have dreamed it? With the city behind me, to the left I would see the massive bridge that links the continents of Europe and Asia. Straight ahead - the ancient Topkapi Palace where, for 400 years, the Ottoman sultans ruled their empire - built 1465. There would be Haghia Sophia (Aya Sofya), one of the world’s greatest architectural achievements, built about 1,400 years ago, and I would wish I was already wandering inside her walls. I would look out over the Golden Horn, the Bosphorus and the Marmara Sea ... all mysterious names that meant nothing until I lived there and then, walking on round the tower balcony, I could look down at the Italian architecture of the area or further, or over to Levent and its post-modern skyscrapers ... so happy to be back in this city that I love. 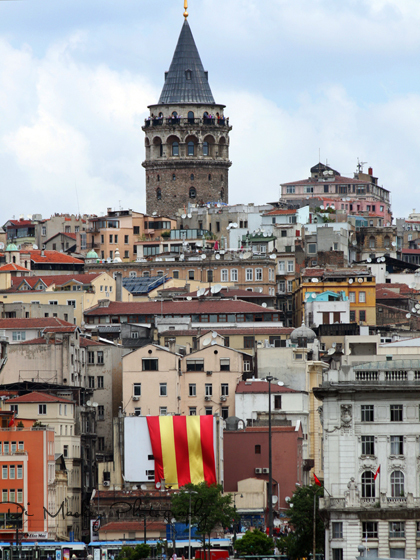 Back on the street, the tower behind me, I would walk on down the hill until I reached Galata Bridge. I can never resist a looking into the fishermens buckets, filled with water and fish, happy to be in amongst the noise of the city ... the simit salesmen, the bait and water salesmen shouting their sales cries all round me. I would reach Eminonu and descend down into the Pazaar, (market) wander a while in the place where the smell of fish cooking is the air. I would pass by the doner seller, watch people arranging themselves on the old ferry bound for Kadikoy and walk on, through the tunnel, to the Egyptian Bazaar. The Spice Bazaar too. I would wander awhile, exploring the cheese and olive selections outside, always unable to resist visiting the stalls where the leeches are sold, watching the birdseed sellers, the people ... always the people. But still there would be more. On up the hill into Sultanahmet, the place where some more of my favourite places are found ...Haghia Sophia is there, Yerebatan Sarayi (the Underground Cistern)- place of incredible beauty, and the Blue Mosque. In need of some cay, I would walk back along the road to Cemberlitas and my favourite cafe. The waiter and I would catch up on each others news. He might ask me about the friend I brought last time, and I would ask about how busy they were and if the tourist season had been kind. A potato gozleme and two cay before moving on ... wanting to spend a little time in the halls of the Grand Bazaar (Kapali Carsi) finding new scarves ... always the scarves but enjoying the banter with salesmen in this ancient labyrinth of 4,000 shops. Once, I met a man from Afghanistan there. He had just finished his first year of training to be a doctor when the Taliban forced him and his family to flee. They moved through many countries until they made their home Istanbul. They were fluent in at least 7 languages. He was a nice guy, with a store like an Aladdin’s cave, full things that I can’t begin to describe ... a surprise tucked down a small corridor that I have trouble finding each time I return. And perhaps that would be enough, although I would surely stop to say hi to Hayden - the Yeni Zelanda who arrived and stayed ... an Istanbul travel agent now. Backpackers and travelers would come and go while we talked, booking their trips and so, I would head up to the rooftop bar ... drinking a cold Efes beer as I watched the ships queuing for entry out on the Marmara Sea. Then hearing the call to prayer go out of over the city, I would realise it was time to go home. Going home was always much simpler ... the metro from Sultanahment to Karakoy, a short walk up to the underground cable car at Tunel, where I could sit as the cable pulled the passengers uphill on one of the oldest cable cars in the world. I would stroll back along Istiklal Caddesi, amongst all the Turks who are just arriving as this yabanci heads home, going down into the underground Metro in Taksim Square, two stops to Mecidiyekoy ... and then up into the craziness of shoeshine men and flower-sellers, traffic and smog. I would cut across the main road, under the highway overpass, then wend my way down into the place where I lived ... that little village-like suburb in the middle of Istanbul. 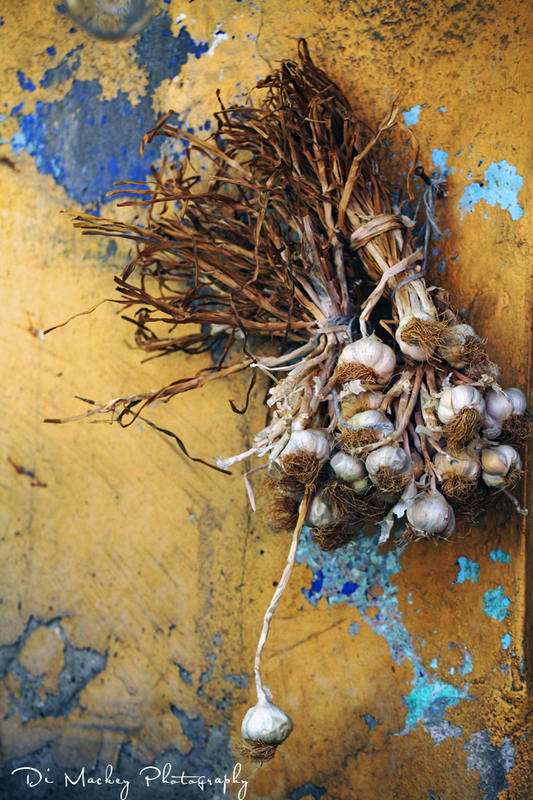 The image below, garlic hanging on an Istanbul wall.